Not many people plan a sunrise Grand Canyon wedding. But Jenny and Steve did and it was a beautiful morning at Yavapai Point! That’s not to say it wasn’t chilly. It was! But these guys are from Chicago. They could handle it. Sunrise at Grand Canyon is pretty magical. It always feels a little special to witness daybreak along the rim. And adding a wedding ceremony to the mix does not hurt. With a handful of friends and family watching, Jenny and Steve said their vows as the sun rose above the rim. 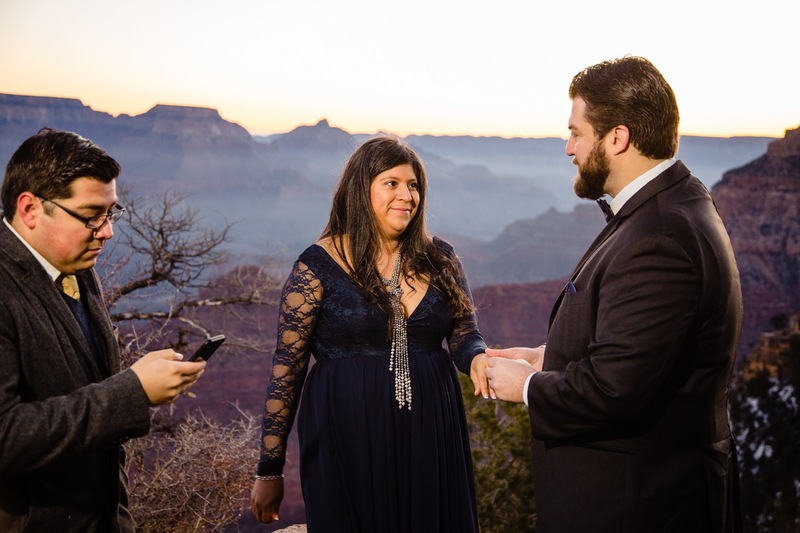 After the ceremony, we enjoyed the sunrise along the rim, making portraits at different vantage points. Jenny and Steve are expecting a little one, so we added a few maternity shots in as well. Once the sun was higher in the sky we headed inside the Geology Museum to warm up and take a few more portraits. Super fun morning and a beautiful celebration! Enjoy!